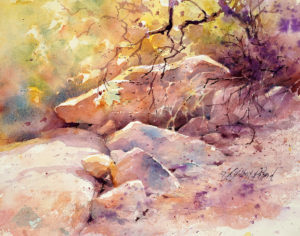 Rocks, Boulders & Pebbles: the "bedrock" if you will of landscape painting. Creating the shapes and forms of individual rocks and learning to combine them into a collective shape that "says rocks" without detailing each is crucial to successful landscape painting. We will focus on the challenge of painting a landscape in which rocks are a significant feature. A photo will be provided for your use but you are always welcomed and encouraged to paint from your own reference material whenever you wish. There will be demonstrations of techniques suitable for the subject, exercises, ongoing critique, and plenty of painting time. Class time will be structured, yet open enough to accommodate the artistic spirit within us all. All levels are welcomed and encouraged to attend. The only prerequisite is an attitude of joy in the act of painting.